Henrik Fisker has taken to Twitter to tease an "exciting" new model which will be part of a "whole new segment." While the image only shows the upper half of the vehicle, it appears to a mobility shuttle in the form of an MPV. 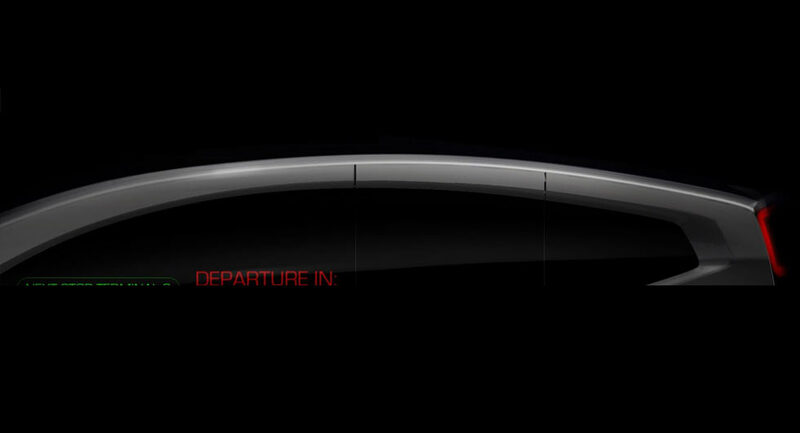 This further back up by the text in the model's window which shows a departure time and Fisker's hint that "the future of mobility will change forever." Fisker didn't elaborate but it's possible the vehicle will have an autonomous driving system so passengers can simply board the model and be whisked to their destination. That's not official at the moment but the upcoming Fisker EMotion will allow for "fully autonomous driving when approved and released by a soon-to-be-announced partnered supplier." Additional information is limited but it's possible the vehicle will also borrow some other technology from the EMotion. That particular car has a carbon fiber, composite, and aluminum structure that enables the vehicle to be extremely lightweight. The EMotion also uses a new powertrain layout that creates a spacious interior and that would certainly be helpful for a mobility shuttle. The $129,900 EMotion is slated to have a range of in excess of 400 miles (640 km) and a top speed of 161 mph (260 km/h). The vehicle will also have all-wheel drive and a high-tech charging system that can deliver 125 miles (201 km) of range in just nine minutes.